Hey, just some announcements and technical details for people out there that think about WordPress hosting. I gotta sneak something in that I need to rant about a little. 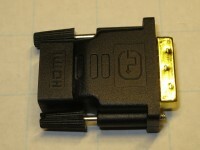 It’s a good old passive signal adapter – for getting HDMI video signals into a DVI monitor. What could the Wan Hung Lo engineering department or qualitty management possible f ck up? Well, as it turns out, making a nonworking (nonfitting) unit isn’t trivial. You have to use deep knowledge about both signal protocols to make it …not work.